Founded in 1986 by Mike Richardson, Dark Horse Comics has grown to become the third-largest comics publisher in the United States and is acclaimed internationally for the quality and diversity of its line. Now the company that revolutionized the comic industry proudly presents it’s ground-breaking digital publishing program Dark Horse Digital. With over 3,500 comics and books available, Dark Horse Digital offers its most popular titles at an unprecedented value, while providing the highest quality reading experience possible. Single-issue comics are priced as low as just $0.99 and we also offer an extensive list of free introductory #1 issues. Additionally, DH Digital "comic bundles" group together story arcs spanning multiple issues into easily affordable packages, allowing readers to get the three or four issues that comprise a complete narrative starting at just $3.99 and up. And through cloud based technology, Digital Store purchases can be read and enjoyed on your laptop, desktop, mobile browser, and Dark Horse Bookshelf App available now on iTunes and Google Play. To get started, simply click here to create an account, and begin building your collection today. 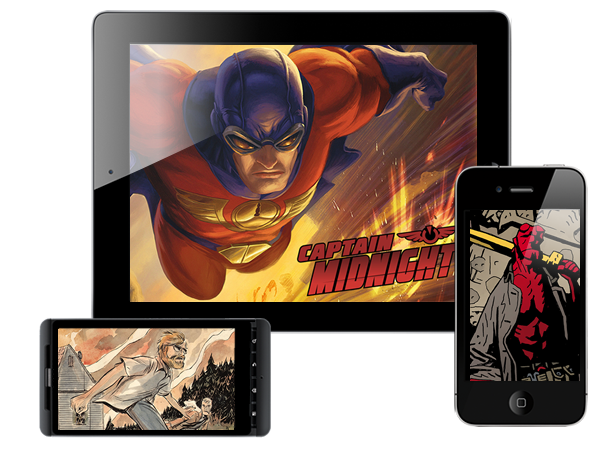 Dark Horse Digital: Comics Anytime, Anywhere!